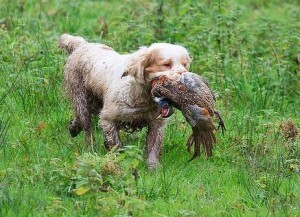 It came to mind many trainee judges probably don’t understand what game Clumbers were worked on at Clumber Park, and what game once shot was picked up or retrieved by them. So here’s some information. 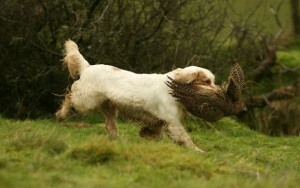 Based on the Wheatley painting the earliest know painting of the breed at Clumber Park, it seems obvious that the following game was available: woodcock, pheasant, hare, written records also speak of the grounds being over run with rabbits. 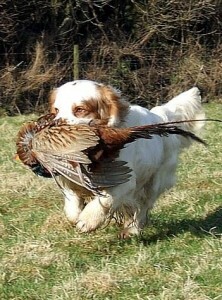 The painting seems to have distorted the sizes of the pointers compared to the spaniels and the game compared to other game species featured, but we can’t be absolutely certain relatively sizes are incorrect. Anyway, assuming the sizes in the contemporary world for field game, I asked Jackie Crawford for some input as frankly the UK bunnies look gigantic compared to the Upper Beaconsfield rabbits. 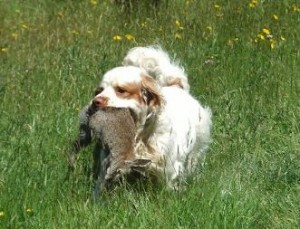 Oh, and let me remind you Clumbers are spaniels, retrieving is a sideline not their main function.